Product prices and availability are accurate as of 2019-04-24 16:04:40 UTC and are subject to change. Any price and availability information displayed on http://www.amazon.com/ at the time of purchase will apply to the purchase of this product. 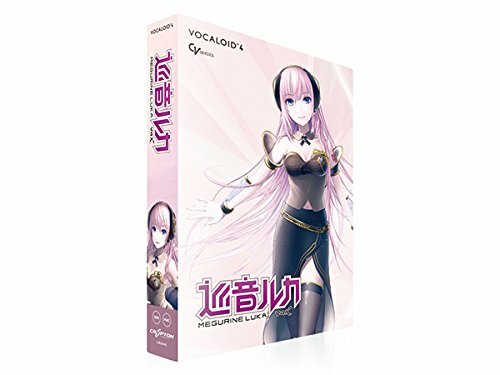 "Megurine Luka V4X" is taping by two types of Japanese/ English database that includes the functions of order to enhance the expressive power. Is enhanced for cross-synthesis and (singing voice morphing) roar (roar) function, respectively, simple you can not alter the tension of the voice in the operation, now can representation of Ganari voice. Likewise, in Japanese, using the recently created "EVEC" (Evec) function in our company, can alter the voice of expression for each note in the song. It is geared up to the expressive power not the conventional singing voice library. In the damp and the A tune, you can whispered in breath, in the rust that run up tune to be or sings powerfully towards from low frequency to high frequency, it is possible to control the expression in a single song. In addition, considering that it is new Piapro Studio, 200 or more type of bundled recording music production software Studio One instruments corresponding to the singing function and pitch graphics features such as "EVEC", from the day I bought, music production environment You're. Corresponding OS: MacOS X 10.8, 10.9, 10.10 / Windows 7 (32 / 64bit) / Windows 8 (32 / 64bit) CPU: more recommended Intel Core 2 Duo 2GHz Memory: more RAM memory 2GB (or more recommended 4GB) HDD: [Mac] 25GB or more of free space (HFS + format), [Windows] 25GB or more of free space (NTFS format) Installation media: [Mac] DOWNLOAD FILE, [Windows] DVD-ROM (3 Disc) DVD-ROM drive / 1280x768px or higher screen resolution / Internet connection environment (at the time of activation) [Windows] graphics board that corresponds to the more sound device / OpenGL 3.0 In order to operate smoothly, we recommend that you be your install and use more high-spec computer. Product specifications are listed here, you may be subject to change without notice.